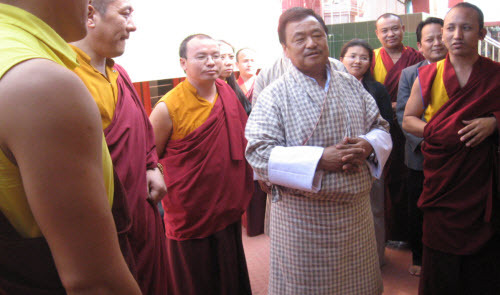 Mr. Zangling Drukpa, Minister of Health, Royal Government of Bhutan along with three members from the health ministry of Bhutan visited Namdroling Monastery at 2.30 pm on 21st January 2010. They were welcomed by the tulkus, khenpos and staff of the monastery by offering traditional scarves and lunch. The guests were informed about the present situation of the monastery. After lunch they visited Zangdog Palri Temple where they received blessings from the holy body of the late His Holiness Penor Rinpoche after which they visited the Golden Temple, the shedra and TT hospital. The visitors were very happy and astonished to see the vast activities of the late His Holiness Penor Rinpoche and Namdroling Monastery as a whole and showered praises for the achievements of Namdroling Monastery. Tea was served after the tour finished and gifts were exchanged. 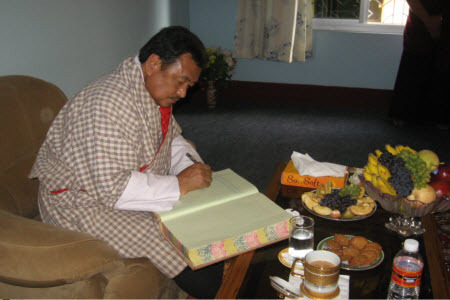 The faculty members of Namdroling thanked the guests for visiting the monastery. The minister and his entourage left for Bangalore at 5.30 pm on the same day.